Google Slides (Public Link) – answers will pop up as you advance the slides. For enrichment, in notes section, you can ask students if the mixtures are element mixtures, compound mixtures, or an element & compound mixture. 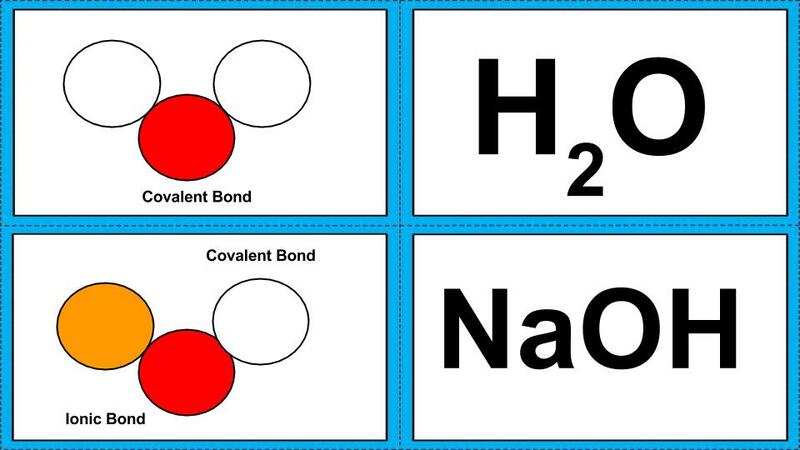 You can also ask students what types of bonds are shown in the diagrams: Ionic, Covalent, or Metallic. Handout – students can write answers onto the handout as you review each answer. Students can review the slides independently as added practice and self check. This can be a guided mini-lesson for a whole class to reinforce the concept. Students can work in pairs to sort the cards into the 3 different groups, then discuss the answers as a class. Challenge – categorize the mixtures. For more lessons related to this activity, please click on the tags below. 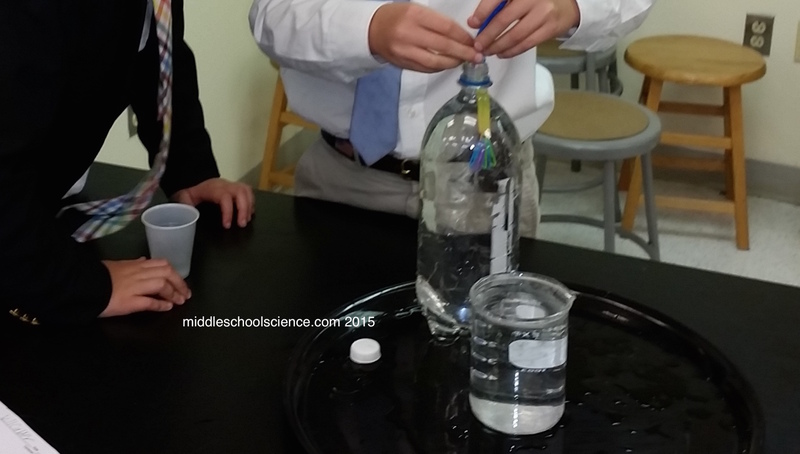 Cartesian Divers – test out your divers in a beaker of water and then add to the 2L Bottle. Keep all your materials on the tray to manage spills. This was the easiest, and most inexpensive way to make cartesian divers I have ever tried, and each student got to take theirs home after class. Did I mention how much fun it was?! 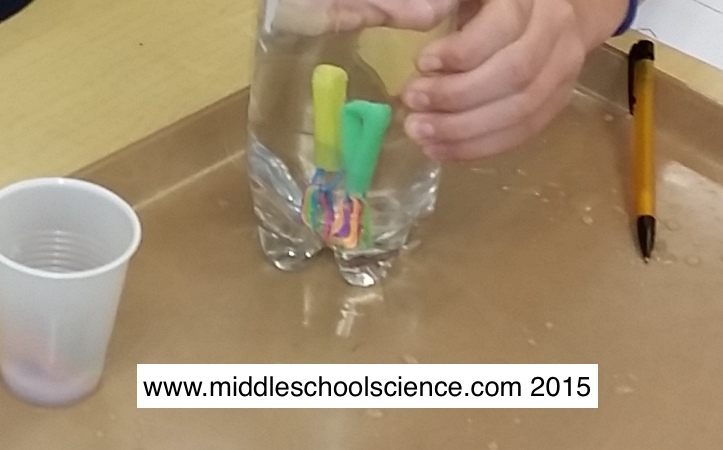 As part of our density unit, we talk about the concept of buoyancy – why do objects float or sink? Using a 2L bottle of water, a glass medicine dropper, and some blue food coloring, we made guesses and observations about the cartesian diver. The medicine dropper is filled with blue water, checked for buoyancy, and then added to a 2L bottle. Students gather to make observations. What do you think will happen when I squeeze the bottle? What will the blue water do? Why did it sink? Why did it float? What is happening to the air in the diver? What is the water doing? Did the mass of the diver change? The density? Students share their ideas and we come to a conclusion as to why the diver floats and sinks. Be careful bending the straw, any cracks will make the the straw useless. Use a rescue hook for any divers that do not float back to the top. Remind students to place the cap back on the bottle TIGHTLY – or water will shoot out of the bottle when they squeeze it. Lunch or serving trays work nicely to contain spills. 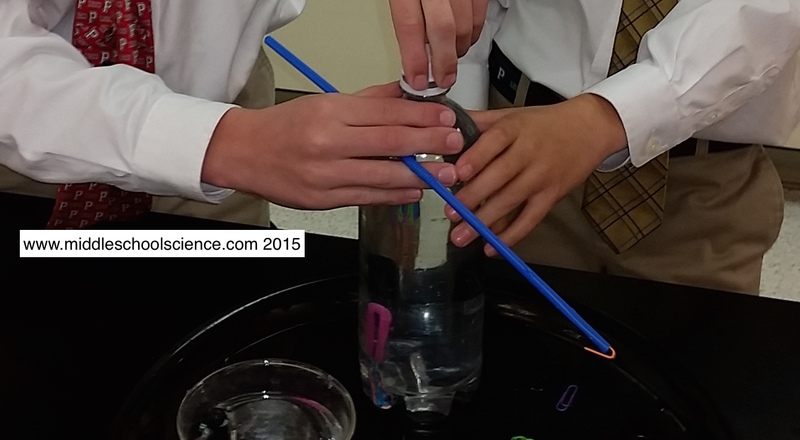 Cartesian Divers: Students can race their divers, who will sink faster? Slower? Float up to the top faster? Slower? Try different modifications and see what happens! Note: I modified this lesson to add a hands-on component with the addition of task cards that students can sort at their desks. 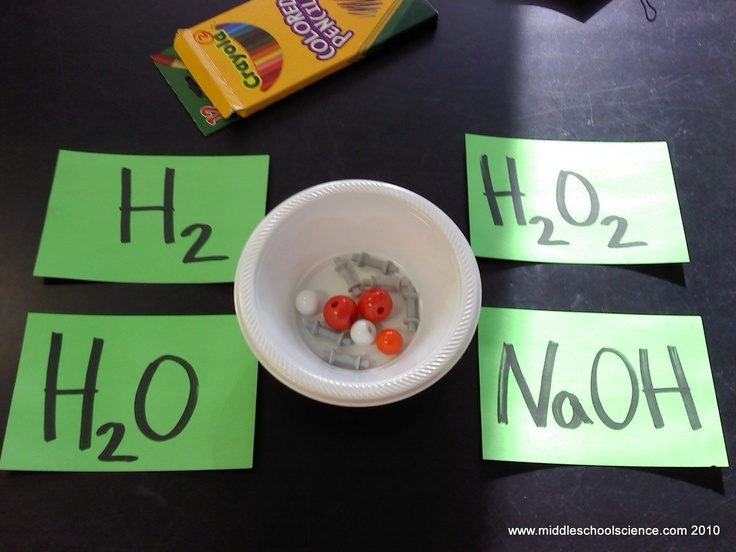 I use this lesson as a group work activity to introduce Elements, Compounds, and Mixtures. Each group will have one set of task cards and one set of ECM? cards to hold up. Once all the groups have had a chance to discuss and sort the items, we will go over the answers as a class. Using the ppt, show the first item (Rocks). Ask each group to choose one of the E,C, or M cards. Have them place the “?” in front of their answer. (this prevents the other groups from seeing their answer) A spokesperson for each group will stand up and hold the ECM? cards. Ask all the groups to reveal their answer at the same time. Compare answers & discuss. Reveal the answer and have students record the results in their notes. If needed, have students move the card to the correct category on their desk, too. For fun, I award a point to each group that has a correct answer, the kids enjoy a little friendly competition :). Continue with the next slide (Copper) and repeat. For more lessons related to Chemistry, click on the Chemistry or Properties of Matter Tabs up above. If doing this activity as a station, supply cards and materials for each formula. For this activity, students will practice reading formulas, counting atoms, building molecules, and identifying bond types. This activity can be used in several different ways. Different stations can be set up around the classroom with 2-4 formulas per stations. Each station will have enough supplies to create the models indicated. Students will complete one station at a time, have their work spot checked for completion, and then proceed to an open station. Making duplicate stations helps prevent bottle necking at the stations that take longer to complete. You can either do timed rotations or have students move freely when they are done. Some stations will be more difficult than others and extra time will be needed for students to complete those models. I like to have several “Make your Own” stations around the room to facilitate movement and give the students more time to explore model making. Instead of stations, each lab group will have a complete set of formula cards and a molecular model kit. 4 students will share the materials and students can work with a partner or individually. The models can be completed in any order, this helps free up the materials so that not all students are waiting to use the Carbon or Sodium atoms. If there are students who finish early, they can check their answers by matching the model images with the formulas using the answer cards (see below). Or they can create games with a partner using the cards. Answer Key is provided. These cards can also be used to play a matching game or as review cards. Free Task Card Templates provided by: Rebecca Bishop at TPT (link) ~ thank you! Be sure to see my Chemistry page (link) for more lessons related to atoms and bonding. Prior to the students starting the activity on their own, I read the scenarios out loud for the class. As I read the text, students independently made a light pencil mark in each paragraph to indicate broken safety rules – anything that they thought might be an infraction. After I read the story, they worked with their partner to find the broken safety rules using the task cards. After a few minutes, I modeled the first broken safety rule to make sure everyone was on the right track and understood the directions. Each student will have a handout with all 5 of the scenarios. Each group will have one set of safety rule task cards. Groups will need to identify the safety rules that were not followed for Scenario #1 and pull the safety rule task cards related to Scenario #1. The rules that were not broken will be placed in a pile to the side. Students will lightly underline where the rules weren’t followed in their notes and write the number of the rule for each violation along with a brief 2-3 word description of the rule that was broken in the margin of their notes. Once they have found and identified all the safety violations for Scenario 1, they will do the same for Scenarios #2-5. Students will find as many of the 18 violations as they can. I don’t tell the students how many safety violations there are, then they can use process of elimination for the last scenario, I tell them that each safety rule task card will be used at least once so they know that there are at least 16 violations to find. There are 5 Scenario Cards. Once the groups have completed the 5 scenarios, they will share their findings with the class. On the ppt, advance to Scenario 1. Ask one group to start – What was the first safety violation in this scenario? Which rule did SpongBob’s crew break? Advance the slide and the answer will be highlighted in either yellow or green font (see image below). The number in parenthesis is the safety rule number. All students will use a highlighter to highlight the phrase and make corrections if needed. Ask the next group if there are any other violations in the scenario, if so, what is the next one? Each group will contribute an answer until all of them have been identified for Scenario 1. Do the same for scenarios 2-5. Each scenario card will reveal the answers, one at a time, and the safety rules that were not followed. The number of the rule is in parenthesis and will match the safety rule task cards. SpongeBob SquarePants® and all related characters are trademarks of Viacom International Inc.
Each pair goes through the cards and discusses/decides where the each card will be placed. Once they have categorized the cards, students call me over verify their work – I will either say “Yes, they are all in the correct category!” or “Not quite yet, try again.” I give a small clue each time I come over. For example, I will say something along the lines of “You have 2 in the incorrect column” or “You have too many in the Physical Change category, which ones should be moved to the Chemical Change category?” or “Two cards need to be flip/flopped to the other category, all the other cards have been placed correctly” or “All of the cards that are placed in the Chemical Change group belong there, but not all of them are there quite yet, what else can you move to that category?” – I won’t tell them the specifics of what needs to be changed. This forces the students to re-evaluate their choices and make changes as needed until all of their cards in the correct category. Every few minutes, I will give the whole class a clue. This allows them to check their progress and verify one answer at a time. One card that many students have difficulty with is the boiling water card – and that is usually the first clue I will give out once I have had a chance to check every group’s progress. Each pair of students continues working together until all the cards are placed in the correct category. Once I’ve verified their placements, they add the answers to their notes and answer the questions for the activity and we discuss our results. 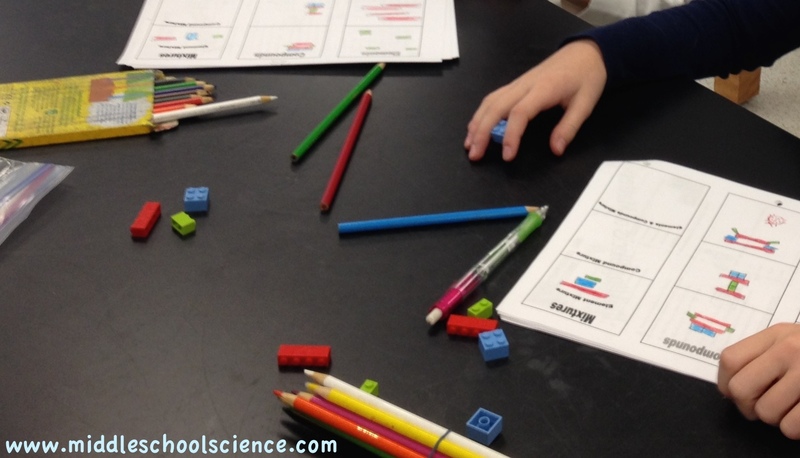 I use this activity to help students visualize how atoms are used as the building blocks of matter and how matter can be classified as elements, compounds, or mixtures.